The New Year presents the perfect time to look back in order to move forward, take stock of what we have in order to make goals for what we’d like to achieve, and always resolve to be the best we can be. This applies to home décor too. The environment we surround ourselves with directly impacts our mindset and is often a direct expression of where we are emotionally. 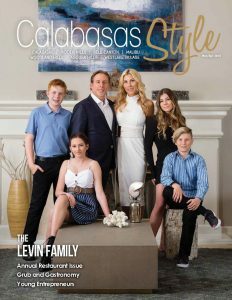 So, whether your goal this year is to make small changes that will have a big effect or a large overhaul to transform your entire outlook, my gift to you this New Year is a look into the future of home and building design and décor trends that you will definitely want to consider for your own home. The Hygge concept of design definitely comes into play in 2019 and beyond. Whether you know what it means or not, you are seeing its impact on lifestyles everywhere. Hygge is the Danish way of living that involves finding joy in the simple things in life. It celebrates coziness, warmth, natural elements, and no nonsense. Clean lines and clutter free, think of Hygge as mindful minimalism. It’s a feeling or moment in the here and now that’s cozy, charming, and special. As more homeowners adapt to the idea of a no-nonsense, clean, contemporary style, home builders and designers are meeting these needs by using fewer casings and moldings as a noticeable start. On many of my new construction projects, there are no crown moldings at all and we’re skipping window casings for very simple baseboards. Instead of white, we are specifying windows in black for a richer look that resembles metal. Shaker paneling is getting to be tired, and clients are opting for flat-panel cabinets in gorgeous white oak woods with simple-but-luxurious hardware. The monochromatic white kitchen is no longer the top choice. An easy fix for this is to liven up a backsplash with a great graphic or colorful tile. 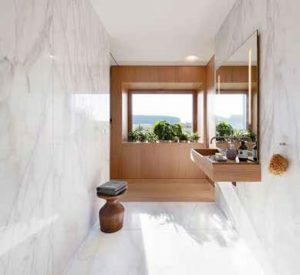 For years now, marble has been a first choice, but handmade ceramic tiles with texture that exude a natural hand-crafted look are all the rage with design enthusiasts looking for a natural, cozy feel. If your comfort level can handle more than just adding color to the backsplash, go for a richer color on the cabinets as well. Try a deep gray blue, deep green, or even navy. If that’s too much color for your taste, natural rift-cut white-oak cabinets make for a gorgeous kitchen that nicely contrasts any stone and tile. Look for simple, beautiful patterns that reflect a time period or nature. Keeping with nature, a beautiful landscape and natural light will add instant beauty. So, if you have beautiful surroundings right outside your kitchen, opt for a glass window backsplash! In keeping with warmer tones, many manufacturers have created smoke and black-colored stainless steel. Dacor’s new Heritage line of smart appliances is equipped with multiple high-tech functions, including cameras built into the fridge and ranges with a built-in steam oven, push-button doors, and much more. 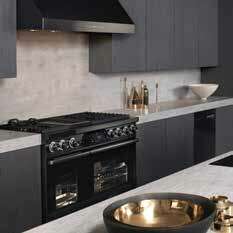 Having appliances available in stainless black is a dream come true for cooking lovers and style mavens. The highest-end kitchens are adding luxury induction cooktops to finish off the striking look. Floral is in—but not your grandmother’s floral. Using accented or large-scale floral wallpaper, inspired from Scandinavian designs, adds a wonderful natural and relaxed feel to girls’ rooms and guest rooms and as an accent wall in a master. As always with wallpaper, it’s versatile in that it can easily be updated as tastes or the purpose of the room changes, without breaking the bank. Four-poster beds are back—in wood, metal, and acrylic. In times of uncertainty, we love to shelter ourselves, and four poster beds comfortably cradle us in. A lot of my clients are now asking for merged showers and tubs in their master bathrooms, and if you’ve toured new construction or spec homes, you have probably noticed this trend. Careful consideration to appropriate square footage is needed, and of course, tub shape is crucial. Use tile in linear drains and a curbless shower to get the smooth-floor look. 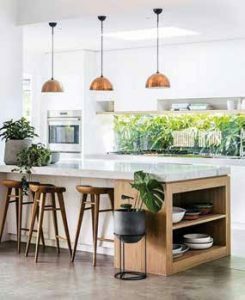 Using simple shapes and an abundance of natural wood tones as influenced by Danish styles, creates serenity to finish off the look. For powders, sultry bold and black bathrooms evoke a very high-end feel. Just don’t make the mistake of going glossy on the walls. Out with the gray and in with the…brown. Yes, brown. 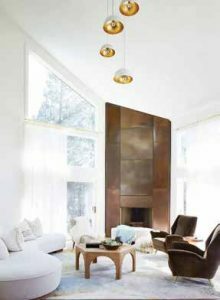 Taupes, beiges, and natural, rich browns and rusts accented with brass metals add richness and warmth to living spaces. Curved furniture and sofas based on 1960s Italian design are making a beautiful comeback and can add instant chic to your living room. 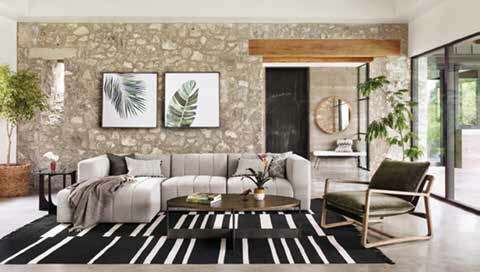 Horizontal or vertical channeling on upholstery is also a throwback style that offers a great contemporary alternative to tufting. Finally, comfort is still everything! Bring in some natural fibers for your upholstery and drapes in rich, thick, Belgian linens and hemp linens. In the year of mindful minimalism, simplicity and clarity lead to good design.